Edward Kendrick, another of our Colorado authors, has a little snippet from a work in progress that went with one of the Thousand Word Thursday Pics. “Why don’t you look around while I have a few words with Juste,” Dilys told Tien. Tien took the hint and strolled down one of the aisles, stopping when he found the section dedicated to the paranormal. 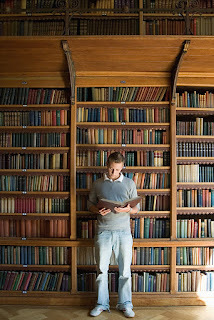 Pulling out a book that looked intriguing he began to thumb through it, found an interesting story and began to read. He got lost in it, so when Juste tapped his shoulder he jumped, almost dropping the book. Embarrassed, he shoved it back where he found it. “Dilys is ready to leave,” Juste informed him, a smile quirking his lips up. When Juste didn’t move Tien frowned, started to turn to go the other way, and realized the aisle dead-ended at a wall. Again Juste was watching him as he had earlier in the office. And again Tien wasn’t certain what to make of his scrutiny. It certainly couldn’t be for the reason he was thinking. Not from a man as gorgeous as Juste, a man who probably had all his female customers eating out of his hand. Tien inched past him, more than ready to find Dilys and get out of the store before he let his imagination get the better of him. A hand landed on his shoulder and he froze. “Here, take this with you so you can finish it.” Juste held out the book Tien had been reading. “I’m loaning it to you.” Juste smiled as he waited for Tien to take it. “Thank you,” Tien whispered. He practically grabbed the book, ignoring the spark of desire he felt when their fingers brushed. Tucking it under his arm he walked quickly to where Dilys stood, let her know he was there and when she placed her hand on his arm he led her out of the store without a backward glance. “Be careful around Juste,” Dilys said once they were safely on the sidewalk. “He has no reason to come after me,” he muttered. Edward has a new release coming! 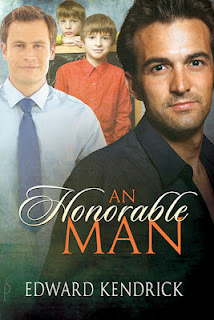 An Honorable Man will be out Saturday, June 16, just in time for Father's Day. Paxton, a forensics scientist whose wife has deserted him and their twin sons, becomes embroiled in trying to catch a serial killer when the boys discover a human finger-bone while rock-hunting. As more bodies turn up, and his housekeeper takes temporary leave, Paxton turns to Jordon, the boys’ grade school teacher, to watch them after school. There is only one problem, Paxton and Jordon were lovers before Paxton married. Now, with his wife gone for the past two years, Paxton finds he still has feelings for Jordon, feelings which may be reciprocated. For the sake of his sons who hope their mother may someday return home, and his own belief that she might, he fights to be an honorable man. Get updates on Edward's news here at his blog. Great flash fiction! Love Edward Kendrick!! Nice extract - love that phrase, Loup Garou, really rolls off the tongue! I had to Google the Loup Garou - there now I've learned something today! I'm so looking forward to An Honorable Man!! Sounds interesting, definitely going to keep my eyes open for this one. I too had to google Loup Garou and learn something new too. Nice snippet. I liked the snippet, how in progress is this work? Nice snippet, but I like the sound of this book as well! Out in the Rockies Blog Tour! I didn't forget the eyecandy!